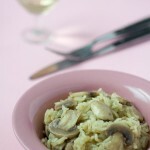 Risotto with mushrooms in white wine is the lazy person’s way to a rapid feast! Today we do the tremendously flavorful rice simmered in wine, and topped with softest portobello mushrooms. Like most people, you probably make the same recipes again and again. Once you have a routine, it’s deceptively easy to see ingredients as having only one purpose. Ground beef is a good example. After a while we get in a rut of only making hamburgers with it, forgetting many other quality dishes. I’m certainly guilty of this. Especially concerning rice. I’ve mentioned it before, but rice itself can be a trigger for many Sarajevans, having had to eat it almost daily during the siege. It took a while to learn to like it again. I did, and still do. Yet when I make it, rice is hardly the centerpiece of the meal. However I’m happy to say this has changed. 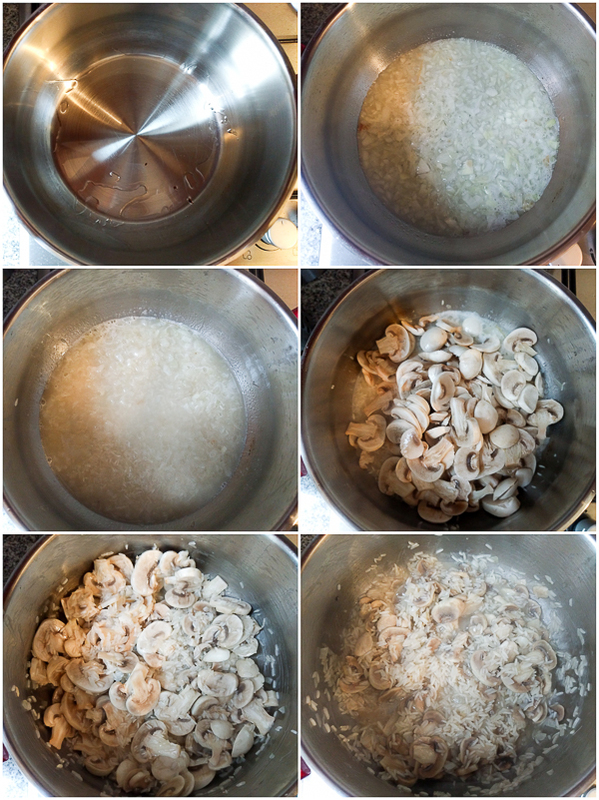 Mika Dajmak comes to the rescue again, coincidentally with another mushroom recipe. 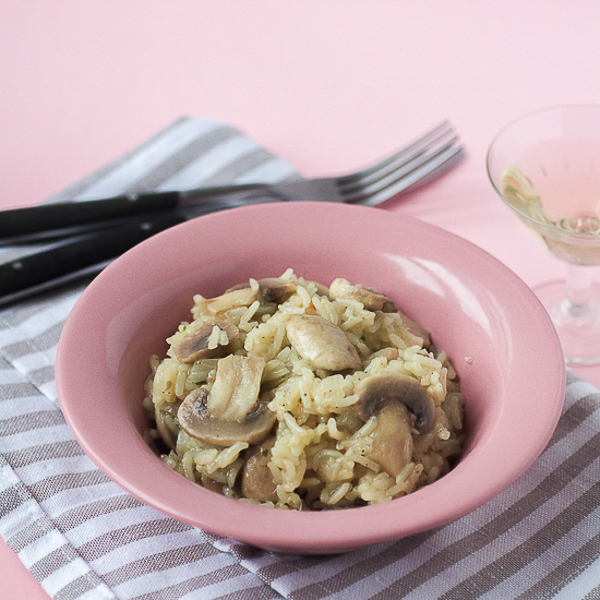 This time we’re talking risotto with mushrooms in white wine. I made it once, only once, but it was such a quality meal I had to share it with you. Backtracking a little bit Mika Dajmak wrote the incredible, hard to find, cookbook called All Over Ex-Yu With a Fork. I only picked it up by accident. You see, I’m serious about keeping things around me simple. I’m a minimalist. Now, I do give myself complete artistic freedom to make as big of a mess as I need, for as long as I need, when I work. At the work’s end though, things are put back. Because of Mr. Dajmak’s book. It’s so good, I actually kept it. 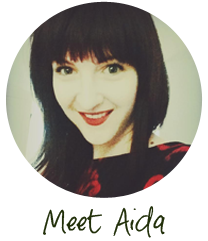 And I highly recommend you get your hands on it if you speak Bosnian, Serbian or Croatian. Or if it comes out in English and you see it, grab it. Back to our mushroom risotto. It takes less time to make than a load of laundry. And when you serve this dish, it’ll feel as if you’re at a good restaurant. For the wine in the recipe, I used a homemade Croatian one I got from my uncle, but Pinot Grigio or Chardonnay will work well. If you’d like to use a different white, go ahead but skip the sweet wines like riesling. 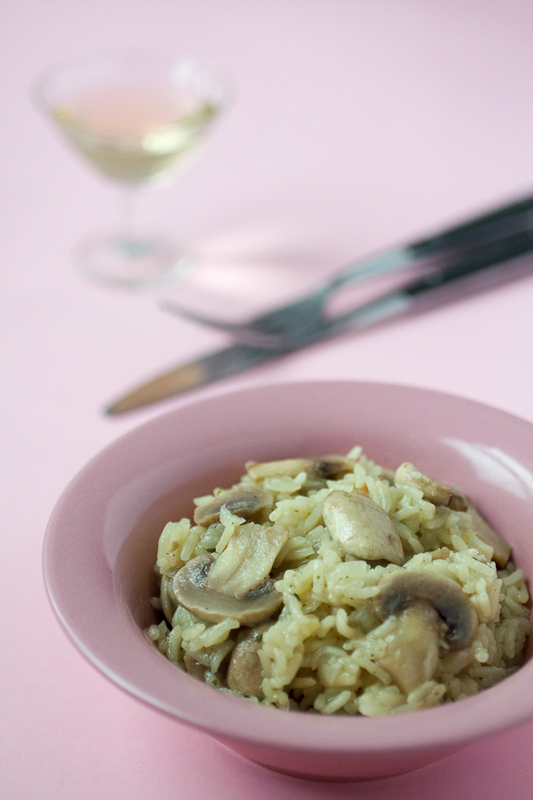 Otherwise risotto (mushrooms too), will take on a sticky, candy-like flavor. Heat oil in a deep pot over medium. Mince onion, add to the pot, and simmer until it crystalizes. Wash rice, drain, and add to the onion. Cover with wine, and let simmer. Stir occasionally. After a few minutes, start adding hot water to the pot. (Over the entire cooking period you’ll add between 1.5 and 2 cups of hot water to the rice. Determine the volume based on how the rice cooks. If it looks sticky, add more.) Simmer for another 10 minutes. Stir occasionally. Wash and dice mushrooms. Add to the pot. Mix everything well. Simmer for another 15-20 minutes, or until mushrooms are soft and the rice is done, stirring every few minutes. At the very end, garnish with seasoned salt and parsley. Recipe was adjusted from Mika Dajmak’s cookbook (Dajak, Mika. (2014) “All Over Ex-Yu With A Fork.” MARSO doo. ).